Not to be forgotten among the monthly flurry of updates on all the new titles coming to each streaming service is Redbox, the handy kiosk that spits out cinematic adventures. There are a handful of noteworthy movies coming to Redbox, both physically and via VOD, in the month of October, so read on for our quick (and hopefully helpful!) breakdown of the highlights. We’ll start with films coming to the Redbox itself—that is, kiosks. 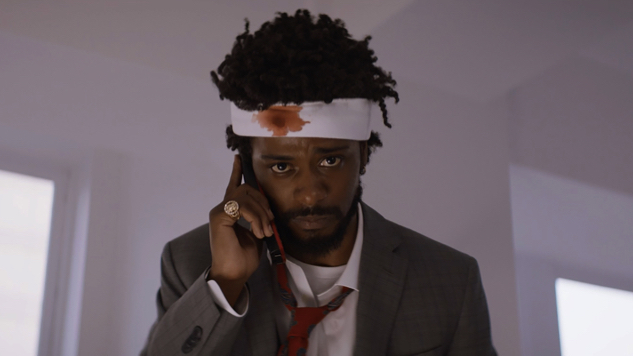 If you ask us, October’s top title is Boots Riley’s directorial debut Sorry To Bother You, coming to the box on Oct. 30. The film stars Atlanta’s Lakeith Stanfield as Cassius Green (Say it slowly … “Cash is green”), a downtrodden telemarketer who’s determined to work his way up the corporate ladder—once he discovers the power of using his “white voice” (provided by David Cross), Cassius becomes the company’s brightest rising star, and enters an increasingly surreal world we wouldn’t dare do you the disservice of detailing any further. Preceding Sorry To Bother You earlier in the month are drug war thriller sequel Sicario: Day of the Soldado (Oct. 2), Blumhouse Purge prequel The First Purge (Oct. 2), Debra Granik’s acclaimed wilderness drama Leave No Trace (Oct. 2), stranger-than-fiction documentary Three Identical Strangers (Oct. 2), star-studded actioner Hotel Artemis (Oct. 9), Bo Burnham’s stellar directorial debut Eighth Grade (Oct. 9), Gus Van Sant-directed John Callahan biopic Don’t Worry, He Won’t Get Far on Foot (Oct. 9), Marvel blockbuster Ant-Man and the Wasp (Oct. 19) and long-awaited Mama Mia! sequel Mamma Mia! Here We Go Again (Oct. 23), among others. As for Redbox’s incoming VOD additions, there’s quite a bit of overlap with the box-bound list, though there are also a select few on-demand exclusives. Leave No Trace, Sicario: Day of the Soldado, The First Purge and Three Identical Strangers debut on VOD on Oct. 2, as does the VOD-exclusive cartoon special Bugs Bunny’s Howl-Oween. Another VOD exclusive, Loving Pablo—starring Javier Bardem as Pablo Escobar—lands on Oct. 5, followed by Don’t Worry, He Won’t Get Far On Foot on Oct. 9, Law Abiding Citizen (also VOD-exclusive) on Oct. 14, Sorry To Bother You and Mamma Mia! Here We Go Again on Oct. 23, and VOD-exclusive YA thriller The Darkest Minds on Oct. 30. So whether you’re willing to leave your couch to pick up a flick from a kiosk, or would prefer to access your streaming movies from the comfort of your own home—especially since things are getting spooky out there with the onset of Halloween season—you can avail yourself of Redbox’s full incoming film slate below.